VIDEO: OJ&B Talks to Sunny Melet From GuestofaGuest.com At The MBFW Tents! 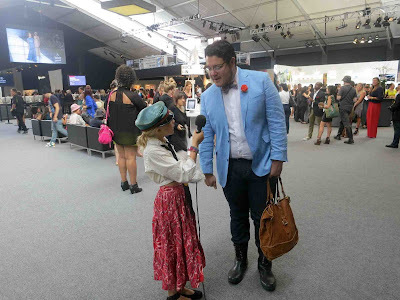 Earlier this week I had the honor of meeting and being interviewed by Guest of a Guest's newest contributor who took to the Lincoln Center tents to interview MBFW fashonista's about the shows, their style and more. According to Guest of a Guest, Sunny Melet is the daughter of Bob and Pam Melet. When she's not working hard in school and for Guest of a Guest, you can find her spunky style gracing the sands of Montauk and the aisles of her father's store, Melet Mercantile in Soho. Thanks so much to Sunny and Guest of a Guest for the fun interview! OJ&B wishes Sunny the best of luck! She is going places for sure! Be sure to check out the complete article about Sunny's first trip to the MBFW tents by clicking here.